Blue Mule - a unique group of musicians working in a bluegrass context with heavy doses of jazz, rock, blues and country. 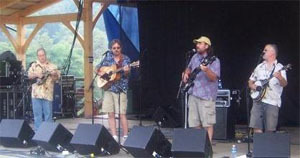 Blue Mule - creative song writing bringing a fresh perspective to modern acoustic music. Blue Mule - a performance that is one of intensity, spontaneity and the pursuit of "playing that lick just a little bit better than the night before". Danceable, listenable and hopefully, memorable long after it's over, a set by Blue Mule is unlike any you've heard. Blue Mule - it's what you're doing this weekend!